123Net’s Dark Fiber product offers a variety of optical fiber options from individual strands to complex high count cable designs, customized to suit your business needs. This secure and cost-effective solution offers a private network with virtually unlimited bandwidth. 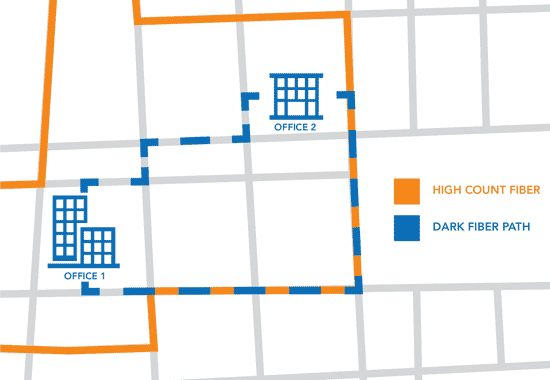 Dark fiber provides physical security and keeps you in control of your communications infrastructure. Designs options start with a single pair of fiber and can be designed in either a ring or point-to-point solution. Networks can be built using the existing 123Net high count fiber or a new network path can be created. 123Net’s unique fiber assets, routes and secure rights-of-way provide the network infrastructure that your business needs, where you need it, to support mission-critical applications. Manage and control your very own fiber network. The only Michigan-based Dark Fiber provider in the state. Available designs include single entrance, dual entrance, ring, hub and spoke or point to point. Lower investment than building your own optical fiber network. Complete control and management of the network. Supports many configurations, services, and applications. Skilled Project Management personnel take you from drafting to turn-up, on schedule. Leverage 123Net’s networking expertise and support. Strong ROI for companies that use substantial bandwidth and utilize numerous services. Take total ownership of your network and tap into the benefits of 123Net’s dark fiber solutions. Security: Comply with government regulations by isolating the physical-layer. Scalability: Upgrade bandwidth at any time without additional monthly costs; solution tailored to your unique connectivity requirements. Reduced Downtime: Enables your business to control maintenance windows. Control Costs: These benefits are available to organizations at a rate that is less than alternatives. Design: 123Net’s engineers will work with you on suggesting equipment to fit your needs.